First registered product in the myTomorrows portfolio, to continue access for those facing urgent medical needs. 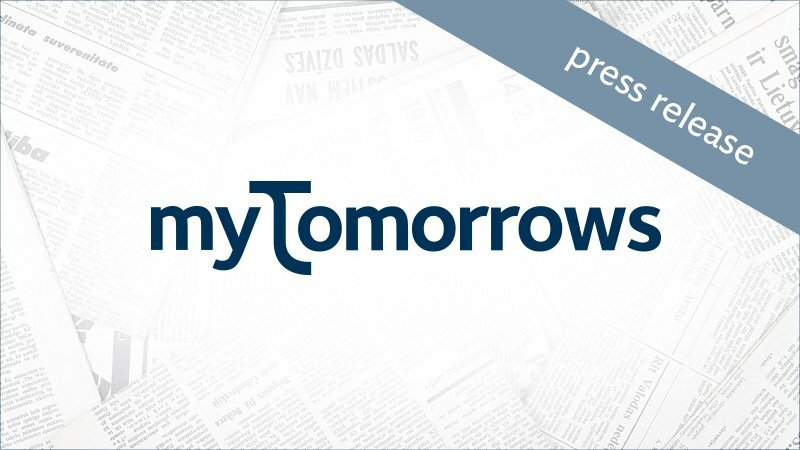 MyTomorrows, a company facilitating Early Access to drugs in development today announced that they have entered into a promotion agreement with Spectrum Pharmaceuticals for Zevalin® in Europe. Through this new partnership myTomorrows is fully committed to continue to provide Zevalin® (ibritumomab tiuxetan) for patients suffering from follicular non-Hodgkin's lymphoma (NHL). myTomorrows, under the legal entity "Impatients Holland B.V.", will assume full responsibility for managing the promotion of Zevalin® in all European countries. While people may live with follicular NHL for many years, there is still no cure for the disease and in most cases, following a period of remission, the disease will come back or "relapse". Follicular lymphomas are radiosensitive and radiotherapy is considered "standard treatment" for patients with early stage, localized disease. With a product such as Zevalin®, targeted Radio-immunotherapy (RIT)[1-3] is a standard of care strategy for the treatment of indolent NHL because the disease is multifocal and radiosensitive, and has recently been shown to remain a relevant approach for lymphoma patients. Chief Executive Officer of myTomorrows, Ronald Brus said "We are very pleased to be promoting Zevalin® as this reinforces our commitment to serving patients facing urgent medical needs". Mr. Brus continued. "Within hematologic diseases there remain many patients with urgent medical needs that require complex treatment strategies, we remain fully committed to providing healthcare professionals with effective treatment options." Patients with previously untreated follicular NHL who achieve a partial or complete response to remission induction. Non-Hodgkin's lymphoma is a group of blood cancers that includes all types of lymphoma except Hodgkin's lymphomas. Non-Hodgkin's lymphoma is caused by the abnormal proliferation of white blood cells and normally spreads through the lymphatic system, a system of vessels that drains fluid from the body. NHL can be broadly classified into two main forms -- aggressive NHL, a rapidly spreading acute form of the disease and follicular NHL, which progresses more slowly. Spectrum Pharmaceuticals is a leading biotechnology company focused on acquiring, developing, and commercializing drug products, with a primary focus in Hematology and Oncology. Spectrum currently markets six hematology/oncology drugs, and has an advanced stage pipeline that has the potential to transform the Company. Spectrum's strong track record for in-licensing and acquiring differentiated drugs, and expertise in clinical development have generated a robust, diversified, and growing pipeline of product candidates in advanced-stage Phase 2 and Phase 3 studies. More information on Spectrum is available at http://www.sppirx.com. myTomorrows provides services to patients and physicians in need of drugs in development, when there are no other treatment options left. Through an internet-based platform and an open API, myTomorrows provides uniform public information about Early Access Programs (EAP) and clinical trials to enhance data-driven decision making. myTomorrows also facilitates access requests to drugs in development. For more information, please visit http://www.mytomorrows.com.